Visiting Rikhiapeeth was a personal journey that I had waited a long time to make, to see and experience with my own eyes what Rikhiapeeth was all about. So, attending the Chakra Sadhana course was a beautiful introduction and I couldn’t have felt more welcomed. It gave me the opportunity to focus on my sadhana, deepening my knowledge of the Chakras as a practitioner and as a teacher. 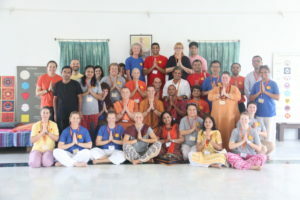 And to be connected at the source, the heart of Satyananda Yoga, where the mandate of Serve Love Give is continuously being practiced was really special. Being in an environment like Rikhia, you benefit from the profound energy that radiates through every nook and cranny. The energy of Rikhia carries you, supports you and gifts you the space to take your practice to a deeper level. With the timing of the course also coinciding with the 9-day Navaratri chanting program, which made the energy extra special. The last day of Navaratri will always be memorable for me, as the day that I took diksha and was given my spiritual name by Swami Satsangi. I had waited a long time to take diksha, it was important for me to be there in person to receive directly from Swami Satsangi, it was a very special moment. The Chakra Sadhana course was so well structured, I learnt so much about the Chakras and was really inspired by Swami Karma Karuna’s teaching, she has the ability to relate the characteristics of the chakras to everyday life situations which makes this topic so accessible for everyone. Each day started with an early morning yoga class with the focus on the chakra for that day, the structure of the class consisted of asana, pranayama, mudra and bandha, with Swami Karma Karuna weaving into the practice’s aspects of the chakra for us to focus our awareness. Following breakfast, we would participate in some light daily Seva duties and then there would be a lecture on the chakra of the day. I had studied the energy centres during yogic studies and had some practical knowledge from yoga classes, but what Swami Karma Karuna delivered during the course was so much more in depth theoretically and practically. 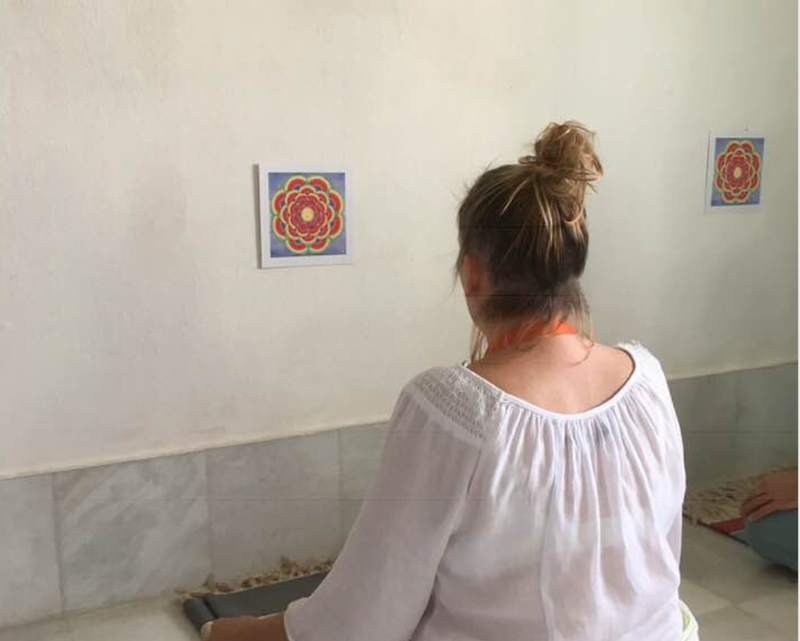 During the course we benefited from daily Yoga Nidra and an afternoon meditation session which included three practices, of which one was Trataka on the chakra for that day. It was a really powerful experience and Rikhiapeeth was the perfect environment to be in for these practices. Most days before dinner we were fortunate to participate in daily Guru Puja with the ashram residents. We were really taken care of throughout the course, and I felt privileged that we were given guided access to areas of the ashram where the presence and energy of Sri Swami Satyananda is deeply felt. One day we were blessed to receive satsang from Swami Satsangi, it was really special to be in her presence to be able to ask her any questions about the Chakras, or about the ashram or any other questions we had. To be in the presence of Swami Satsangi was really inspiring. I learnt so much more about Rikhiapeeth, the history and the incredible work that has been carried out within the community. I was touched deeply by the widows who come daily to the ashram to chant mantra, the education programs that have been set up for the Kanyas and Batuks and now the building of a medical centre, it is quite incredible. I highly recommend attending this course, it was a wonderful experience and I have met some incredible people who I know will be friends for life. It’s an opportunity to learn more about these incredible energy centres, but also an opportunity to discover more about the Self. It’s an experience that I would happily repeat over and over again. previous post: Deep Ecology – What is it all about?